We'd certainly played in Northern Ireland. There were games against Glentoran in 1959 and 1961 and then pre-season tours in both 1996 and 1997 when we played a total of nine games, but none in the Republic, although in the back of my mind I did seem to have this notion of a game having been arranged against Manchester City during the big freeze of early 1963. There was certainly one link between our club and Dublin, and to be more precise between our club and Dalymount Park the home of Bohemians. It was there that our England goalkeeper Colin McDonald saw his career come to an end after he broke his leg in an inter-league game from which he never fully recovered back in 1959. So last month we drew 0-0 in our first ever game there, or was it the first? I still wondered about that lost game in 1963 but accepted it was just my mind playing tricks on me. Then came an email from a Burnley fan based in Ireland. He told me he'd been to the game all those years ago and that it had been played at Dalymount Park. That was followed by an email from another Claret who was able to confirm the date for me - and incredibly it was on a Friday evening (just as it was this year) and more incredibly played on the same date 15th February. Had we really played two games in the Republic, both of them at Dalymount Park and both of them on the same date 45 years apart? The answer is yes. The winter of the 1962/63 season was a bad one, and the harsh weather was with us for week upon week, causing severe disruption to the football programme. We played Sheffield Wednesday on the Turf on 29th December but it was March before we were next in league action against Sheffield United at Bramall Lane. We were fortunate to get that Wednesday game in. We won 4-0 and West Ham's 4-3 win at Nottingham Forest was the only other First Division game to beat the weather. We did play three FA Cup ties during January and February. There was the 3-0 win at Spurs on a frozen, snow covered pitch, and then two games against newly promoted Liverpool that saw us go out to a penalty in the last minute of extra time at Anfield. The league game was called off but unfortunately Blackpool pulled out of the Dublin game. It all looked as though it would have to be cancelled but at the eleventh hour Manchester City, who were also out of action, agreed to go in their place. 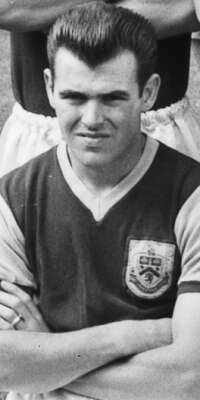 A quick glance at the Burnley team shows that it included two players who went on to manage the club in Jimmy Adamson and Brian Miller, but there was a third future Burnley manager who took part in the game. Just check the Manchester City team and the appearance of a certain 20-year-old John Benson. 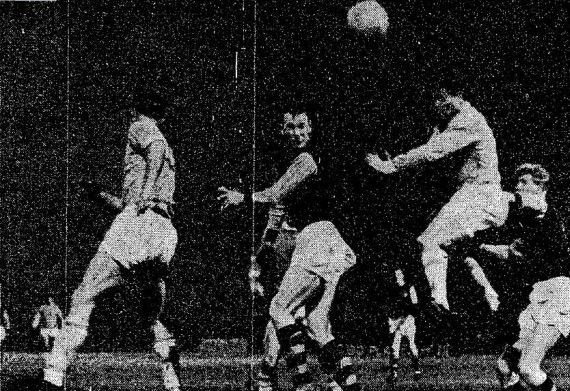 We've been fortunate to find a report of this game from the Irish Times and we are delighted to reproduce that here, our forgotten night in Dublin in 1963. 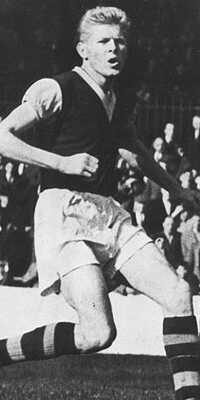 Pointer, the fair haired inside right, was the real threat to the rival defence. However, he placed most of his passes to Connelly on the right wing and the England star was strangely hesitant and, apparently, reluctant to send the ball across City's goal. Dobing, revelling in the mud, tested Blacklaw with a fast shot midway through the first half and placed Harley, his centre-forward, and Young, his outside-left, for volleyed shots. The first was narrowly wide and Young's was beautifully taken down by Blacklaw. Burnley, for all their planned approach work and skilful supporting of each move, rarely looked dangerous. McIlroy, the schemer in the front line, who fed greedily on Adamson's almost casual but ever-accurate supply of passes, tried every stratagem in his vast repertoire to open the Manchester defence. But he was too slow to catch the opposing rear-guard napping. The score was the incentive for Manchester City's retaliatory efforts. Dobing, who was receiving a more consistent service from Benson and Oakes, his wing halves, played some brilliant football. He was assisted in his efforts by Hannah, who replaced Young.